Remember when we depended on professionals to produce art? 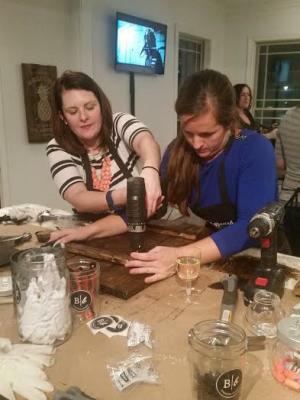 Welcome to the age of Do-It-Yourself studios with Hendricks County on the forefront of this latest trend boasting a variety of shops and studios that let you get your hands dirty and your creative juices flowing with no previous experience necessary. Without exception, knowledgeable staff members give step-by-step instructions, and the studios provide all the materials needed. They even offer fun, family-friendly events throughout the year to create keepsakes for your own family or gifts for others while taking care of the cleanup for you. 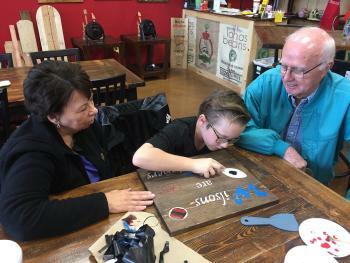 Bisque Barn in Avon specializes in two mediums – pottery and wood signs. Each customer pays a studio fee and the price of the wood or pottery piece, and then has access to all kinds of paint, stencils, doilies, feathers and more. The pottery is premade with all kinds of shapes, sizes and figurines to choose from. You simply pick your piece find the color of paint or other accessories you wish to decorate it with and go to work. If you choose to make a custom wood sign, Bisque Barn offers a variety of custom stencils and the staff there will make sure the stencils are applied perfectly before you fill them in with the paint colors of your choice. Whether it’s a wood sign or piece of pottery, your entire family will be creating a masterpiece in no time. More of a girlfriend getaway or group activity, Board & Brush in Brownsburg specializes in create-your-own custom wood signs. But if you think you are going to walk in, throw some paint on a stencil and leave, you are underestimating this experience. First-time visitors will quickly notice a wall full of hammers, power drills, sandpaper and other tools. It may seem a bit intimidating at first, but the instructor quickly calms the nerves by going through the entire process step-by-step. Participants sand their boards and use different tools to distress them and make them their own before staining and stenciling. You will feel like a master craftsman once your project is complete and will leave with a beautiful wall hanger that you can give as a gift or keep for your home or office. Different than the others on this list, Hot Blown Glass in Clayton is the private, backyard studio of Indiana Artisan Lisa Pelo. But the great thing about Lisa is she doesn’t keep this precious hideaway or her glass talents to herself. Visitors can try the intricate art of glass work by creating a simple piece like a paperweight or pumpkin on their own under the direct guidance of Lisa by appointment. Guests come away floored by the experience and the art they create without any previous experience. You can join a community or participate in a class at our next featured shop. Dave and Erica, the owners of Nomad Yarns, teach a range of classes including knitting, crocheting, spinning, dying and felting in a former home on Main Street in Plainfield that they&apos;ve turned into a fiber wonderland. Veteran knitters can bring in their projects for feedback on colors or techniques. Novice knitters can ask for help on picking patterns and materials. They even offer beginner’s classes. Classes are geared for adults, ages 14 and up, but private lessons are also available. All teaching is done in house by Erica or her husband Dave. Nomad Yarns even hosts a once-a-month class making one afghan square each month using different techniques. At the end of the year, participants sew them together to make the completed project. Finally, you don&apos;t even have to participate in a class to be a part of their community. Every Thursday evening, anyone interested can bring their projects to the shop and work in an environment with others who share their passion or want to learn. One of the newest additions to Hendricks County’s DIY family, The Tie Dye Lab in Avon provides a fun and festive environment for an entire family to design a tie dye creation. Prices are based on what you choose to tie dye. Options include T-shirts, towels, socks, hats, bags and much more. Part of the fun of this activity is choosing the colors and patterns and then seeing the finished product as you don’t truly know how it turns out until you remove all the rubber bands that help transform your item to a tie dye work of art. Again, the staff is very helpful and cleans up the mess after you and unlike some of the artwork above, you get to leave the store with your finished creation in hand after a 10-15 wait. Board games and other activities are provided for your leisure as you wait. The sixth and final DIY studio can be found in Plainfield and possesses similarities to the Bisque Barn with its pottery creations. Unlike Bisque Barn, which also offers wood signs, uPaint offers glass fusion to its lineup. 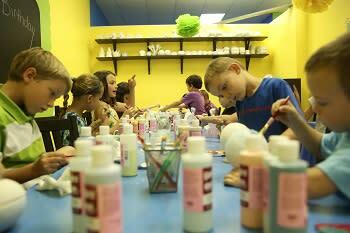 Pottery and glass pieces range from $5-$80 and a $5 studio fee covers the cost of paint, supplies and cleanup. Once you&apos;ve finished painting your pieces, the studio will fire it and have it ready for pickup within seven days.